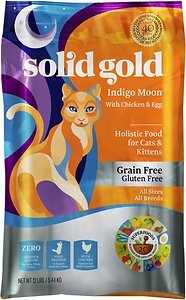 Solid Gold promises to unleash your pet’s “inner gold”, but is it a nutritious and safe choice for your cat? Find out in our unbiased Solid Gold cat food review. We’ve analyzed Solid Gold and graded it according to the We’re All About Cats standard, evaluating the brand on species-appropriateness, ingredient quality, product variety, price, customer experience, and recall history. Here’s how it rates in each of these six key areas. We give Solid Gold cat food a 43 out of 60 rating or a B grade. Sissy Harrington-McGill founded Solid Gold after noticing a difference between dogs living in Germany and those who lived in the United States. Sissy started working to bring German dog food standards to the United States. Inspired by the country that she believed could produce longer-lived Great Danes, the original Solid Gold formula was called Hund-N-Flocken, a German name meaning “dog flakes”. When Solid Gold launched in the 1970s, it was one of the first pet food brands to use the holistic label, incorporating a variety of what the company describes as “carefully curated superfoods”. Solid Gold sources ingredients from around the globe, including pollock from Alaska, duck from France, and venison from Australia. Solid Gold refuses to purchase any ingredients from China. While Solid Gold doesn’t manufacture any of their own products, they claim to maintain strict oversight of all sourcing and manufacturing processes. All of Solid Gold’s dry cat food is manufactured in the United States. Most of their wet cat food is made in Thailand. Has Solid Gold cat food been recalled? Several varieties of Solid Gold dog food were recalled in 2012 when their manufacturer discovered salmonella in their Gaston, South Carolina facility. In 2018, consumers filed a lawsuit against Solid Gold, accusing the company of failing to disclose the presence of “heavy metals, chemicals, and/or toxins” in its food. Third party testing revealed that Solid Gold cat food contains heavy metals and toxins, including BPA. According to Petful, however, all of the heavy metals and toxins were present in levels below the maximum tolerable limits established by the FDA. 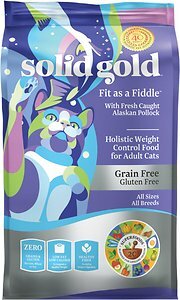 What kinds of cat food does Solid Gold offer? Solid Gold offers a wide variety of wet and dry cat food. Their lineup includes a variety of formulations for cats’ unique needs, including weight management needs, life stages, and more. Solid Gold says that 20 nutrient-dense superfoods are at the heart of each of their dry food recipes. These so-called superfoods are ocean fish meal, egg protein, pumpkin, cranberry, spearmint, carrot, apple, watercress, rosemary, lentil, celery, parsley, almond oil, beet, sesame oil, blueberry, broccoli, thyme, chicory root, dried kelp, spinach, and salmon oil. Their wet food menu emphasizes texture and includes bisques, patés, shreds, stews, and layered multi-textured meals. Whether wet or dry, all Solid Gold recipes feature meat as the first ingredient. They’re free of animal by-products, chemical preservatives, artificial ingredients, and carrageenan. Chicken meal appears to be the primary protein source in this dry cat food. This is one of Solid Gold’s most popular recipes. Customer reviews are overwhelmingly positive—both humans and cats seem to love this chicken-based recipe. The kibble is primarily made from animal protein sources, including protein-dense chicken meal as the first ingredient. Before any more meats and protein sources, however, the food contains a few plant ingredients. Like many grain-free kibble foods, this food contains potatoes, a starchy ingredient that helps to give the food its structure. Canola oil is the third ingredient. It’s followed by a variety of animal protein sources, including chicken, ocean fish meal, and dried eggs. Pea protein, a concentrated source of plant protein, is the last primary ingredient before a long list of synthetic supplements and Solid Gold’s signature blend of the fruits, vegetables, oils, and herbs they call superfoods. Overall, this is a meat-rich dry food with moderate protein, low fat, and moderate carbohydrate content. Compared to most dry foods, it’s rich in animal ingredients with minimal plant protein and low carbohydrate matter. There are 455 calories in each cup of this dry cat food. Pollock appears to be the primary protein source in this dry cat food. Compared to the Indigo Moon recipe reviewed above, Solid Gold’s Fit as a Fiddle formula has about 30% fewer calories per serving. It’s a light food geared towards cats who need to lose weight. Alaskan pollock is the first ingredient in this recipe. After fish, the food contains peas, tapioca, and chickpeas. All of these ingredients contribute to the food’s high overall carbohydrate content. Turkey meal is added as a concentrated source of animal protein, followed by pollock meal, a dehydrated form of the pollock used as the first ingredient. Chicken meal is added as the third rendered meal in the food. Like many grain-free foods, this product contains potatoes as a primary carbohydrate source. The low-fat recipe contains three fat sources—chicken fat, salmon oil, and canola oil. Solid Gold explains that this recipe contains 16 “nutrient-dense superfoods”. These ingredients contribute antioxidants, vitamins, minerals, prebiotic fiber, and may help to improve digestive and immune health. They include berries, spearmint, almond and sesame oil, and probiotics. Overall, this food has moderate protein content, low fat, and high carbohydrate content. The food has 330 calories per cup. Pollock, Peas, Tapioca, Chickpeas, Turkey Meal, Pea Fiber, Pollock Meal, Chicken Meal, Potatoes, Dried Eggs, Chicken Fat (Preserved with Mixed Tocopherols), Natural Flavors, Canola Oil (Preserved with Mixed Tocopherols), Potassium Chloride, Choline Chloride, Dl-Methionine, Salmon Oil (Preserved with Mixed Tocopherols), Taurine, Calcium Sulfate, Carrots, Pumpkin, Parsley, Apples, Cranberries, Blueberries, Lettuce, Celery, Beets, Watercress, Spinach, Dried Chicory Root, Broccoli, Spearmint, Almond Oil (Preserved with Mixed Tocopherols), Sesame Oil (Preserved with Mixed Tocopherols), Yucca Schidigera Extract, Dried Kelp, Thyme, Lentils, L-Carnitine, Vitamins, Minerals, Protected Probiotics. Tuna appears to be the primary protein source in this wet cat food. Unlike other Solid Gold foods with a long list of fruits, vegetables, and nutraceuticals, this popular canned food has a simple meat-based recipe. It’s primarily made from tuna, followed by water and tapioca starch as a thickener. Sunflower oil is the primary fat source, though the food also includes canola oil. Carrots, pumpkin, and spinach add color, fiber, and nutrients. The food is thickened with xanthan gum and supplemented with a variety of vitamins, minerals, and amino acids. It’s described as a shredded food, though reviewers say the texture is irregular with both shreds and chunks of tuna in gravy. Overall, this canned food is a meat-based product that’s high in protein with low fat and low carbohydrate content. There are 161 calories in each 6-ounce can or about 27 calories per ounce. What do customers think of Solid Gold cat food? Solid Gold has enjoyed a cult following since its creation in the 1970s. Most customers, whether second-generation buyers or new Solid Gold customers, praise the brand’s palatability and say their pets thrive on it. How much does Solid Gold cat food cost? 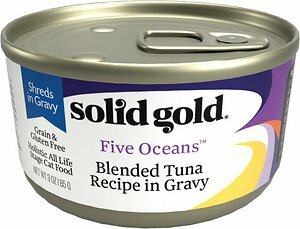 According to the company’s feeding guidelines, it would cost about $2.72 per day to feed a 10-lb cat Solid Gold’s Five Oceans line of canned food. Most of Solid Gold’s wet foods are similarly-priced with the exception of the Triple Layer line, which might cost about $5.18 per day. Like most cat food brands, Solid Gold’s dry recipes are significantly cheaper than the wet formulas. It would cost about $0.34 per day to feed a 10-lb cat Solid Gold dry kibble. Overall, is Solid Gold a good choice? For over 40 years, Solid Gold has maintained a strong reputation for safety and ingredient quality. 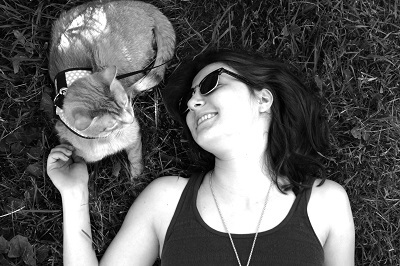 Their foods receive excellent customer reviews and most cats seem to like the way they taste. Solid Gold cat food isn’t nutritionally stellar, but it’s definitely above average. Solid Gold dry foods have relatively low carbohydrate content and, unlike many other kibble products, emphasize animal protein over protein from plants. Their wet food is similar—it’s not the best, nor is it the worst. Solid Gold is mid-priced and of moderate quality. It’s a reliable brand with a wide variety of options for people who want something better than the standard grocery fare, but it lacks the meatiness of other brands like Hound & Gatos and Ziwi Peak. Where is Solid Gold cat food sold? Solid Gold is currently available in stores around the United States, Canada, China, Japan, Hong Kong, Singapore, and Thailand. Online, you can buy Solid Gold cat food through Chewy, Amazon, and Petco’s website. 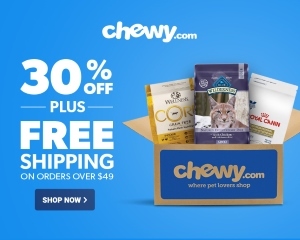 Click here to shop for Solid Gold cat food on Chewy.